Whether it’s an Arkansas Razorback game, business or vacation that brings you to Fayetteville, you must visit world-famous Dickson Street. It is famous for its nightlife and bars, but Dickson Street and the surrounding area including Block Street and the Downtown Square are also known for fantastic live music, outstanding boutique shopping, performance art, world-class dining, the farmer’s market, festivals on the Square and so much more. Dickson Street, Block Street and the Downtown Square are considered the heart of Downtown Fayetteville. 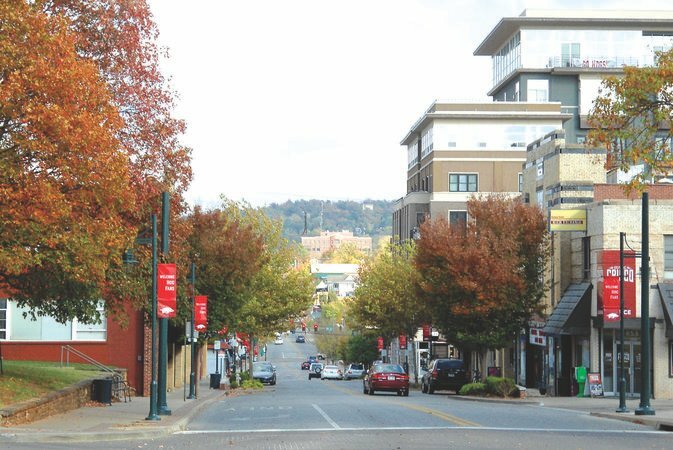 The downtown area is located near the University of Arkansas in Fayetteville and is a popular spot for students, locals and tourists. Block Street connects Dickson Street and the Downtown Fayetteville Square. Below are suggestions for top places to dine, shop and enjoy Dickson Street nightlife. Dining – There are many exceptional options when eating on Dickson Street or nearby. You can choose a Fine Dining experience such as Theos, Bordinos or nearby Vetro 1925. If unique coffee shops are your thing, then be sure to check out Puritan Brew or Arsaga’s (serves incredible food). Less formal, but still top-shelf restaurants include Hammontree’s Grilled Cheese, US Pizza, Wasabi, Emelia’s Kitchen and Doe’s Eat Place. As if that isn’t enough diversity, there is a food truck court (Shulertown) that also offers a variety of top-notch foods and stays open until after midnight. Bars – Dickson street is famous for its nightlife, which includes, pubs, lounges, bars and other terrific places catering to the nightlife crowd. The nightlife on Dickson Street is like no other. You can enjoy fabulous live music at George’s Majestic Lounge, JJ’s Grill, Smoke and Barrel, and Cannibal and Craft or unwind at Farrell’s Lounge Bar & Grill, or even participate in the social gatherings and live music at Willy D’s Rock & Roll Piano Bar. Each pub/bar is within walking distance of the others, and you are sure have a good time no matter where you end up. In addition, to the places listed above, you can’t go wrong by checking out Infusion Bar, Sideways, Brewskis, You know, Uno!, Cork & Keg, Grubbs, Kingfish, Dickson Street Pub, Pinpoint, 21st Amendment, and Ryleigh’s. And although Stage eighteen isn’t technically on Dickson St, it is one of the most popular community performance venues, full bars and art galleries in famous downtown Fayetteville. Performing Art – Dickson Street is the home of The Walton Arts Center, which offers numerous performances and events for all ages throughout the year. These include art classes, theatrical acts, studio theaters, galleries, concerts, and festivals. Entertainers and artists are brought to the center from around the world to give the residents, newcomers and visitors to the area a unique and memorable experience. Shopping – There is quite an eclectic assortment of shopping options available on Dickson Street. Local boutiques like Something Urban, which offers one-of-kind fashion; Underwood’s Fine Jewelers, an amazing family owned jewelry store; Fayettechill Clothing Company, which stocks Ozark Mountain inspired clothing & technical apparel for outdoor lovers. If you love books, of any kind, be sure to stop and check out the Dickson Street Bookshop for unique, quality used books, but if new books are your thing, then check out Nightbird Books. Block Street -This innocent looking connecting street to downtown Fayetteville has all kinds of fascinating places to shop and eat including Hugo’s, one of the best places to get a cheeseburger in NWA or perhaps in America. A few doors down, get your vinyl music fix at Block Street Records. Other Block Street notables include, Shindig Paperie, The Mustache, Fox Trot Boutique and French Quarter Antiques. Enjoy a fabulous cocktail at Maxine’s Tap Room, and, if hungry, drop into Little Bread Company to experience some baked heaven. Downtown Fayetteville Square – The historic downtown square is home to one of the best Farmer’s Markets in the state, and it is also the location for multiple festivals throughout the year. On the first Thursday of each month, you can experience First Thursdays, which includes 40 visual artists, an outdoor art walk, live music, street performers, food and drink, children’s activities and a local craft beer garden. If you are looking for that special something then be sure to shop The Town and Country Boutique, Riff Raff, or The Mustache. Maybe a salad, sandwich, pizza or craft beer, appeals to you, then be sure to stop in Tiny Tim’s Pizza. The Fayetteville Town Center is the location of the bronze sphere that displays the message “May Peace Prevail on Earth” in over 100 different languages, weighs 8,000 pounds, and was designed to be turned by hand like a prayer wheel.